Very often in Pakistan, when women get married they have to leave work and they must stay at home. Even very educated women are expected to do this. Then of course, they soon have children so they become very busy at home. Even in poor families, the married women are not able to work so do not contribute to the family income. 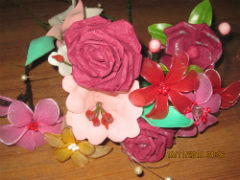 When a woman has a skill like sewing they are able to make a large contribution to the family economics. They are able to save a lot of expense buying clothes and often they are even able to earn some money, all while staying at home. Wazir is an area near to the airport in Islamabad. Our partners are developing a school (PAK06) in a new housing area and many new people are moving into the area. It is a good time to start helping them to settle and develop relationships. 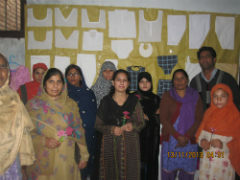 BHW's partners in Islamabad have a growing work and in previous years have run a number of sewing programmes. These have proved to be really helpful for the local people and for building relationships with the community. In 2011 Azam and Barbara Gill were able to purchase a plot of land in Wazir town, a new housing development area. They intended to build there in the future but quickly decided to build a school instead. People were beginning to move into the area and there were no schools. As they developed the school they began to meet the people in the community and noticed that there were many needs, especially amongst the women. Having already run successful sewing programmes in other areas, they thought it would be good to start one in Wazir. The school building was available in the evenings and in 2013 a pilot course was run. It was very successful and they decided to continue running the course. The beneficiaries are the local women who come to the course. They are largely young women with few skills or ability to earn much of an income. A number are from the Pasthun community, they are despised and feared by most Pakistanis. This is meeting very real needs in the community. It gives purpose to the women and opportunities to engage with other people, especially since many of them are new to the area. It gives the Christian people opportunities to gather and meet as well and makes good use of the buildings that are available. It is not easy for Christians to engage with Moslems. This gives opportunities to get to know each other in a neutral environment and interact. Azam has been in ministry since the late 1990's and is very passionate about the gospel. He is married to Barbara and they have three children, two boys and one girl. He gave his life to the Lord in 1987 and in 1991 joined Bible School here in Pakistan. The Gill family is well known and has served the community for many years, especially in Rawalpindi and Islamabad. He has a heart for evangelism but can see the benefits of providing training and education to the poor in his community. The vision of this partnership is to assist women in the community to become more able to contribute to the economic stability of their families. The strategy is to train a number of women each year to sew and to give those who graduate a sewing machine. The annual budget pays for the teacher, the sewing materials for the training, some transport costs for Barbara and Azam, and a sewing machine for each person who graduates.